It’s reminiscent of Get Smart. Agent 86 reaching for some odd item like a shoe and starts making phone calls. Well, it’s not a shoe, but this pen is also a cellphone. 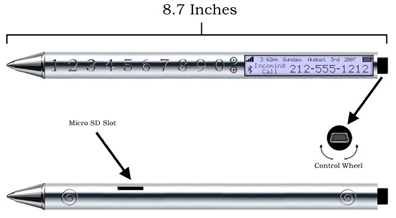 Still in concept stage, the pen is designed to connect with Bluetooth headsets, a USB connector, microSD slot, an mono LCD screen to show numbers, day and date, and cell signal strength information. The are micro (and we do mean micro)phone and earpiece slots at either end of the pen. The only thing really missing from the phone is a camera. Numbers appear to be dialed with a touch interface number system etched into the pen itself but the USB connector also doubles as a control wheel to scroll through address books and call menus. And it’s a good bet that the phone itself also acts as the cellular antenna, as it’s nearly nine inches in length. And the pen even writes. But seriously. Cellphone users already have trouble with dropped calls in spite of shallow promises of improved networks. Is it really practical to expect a design like this will be able to pick up cellphone calls in buildings wrapped by rebar like a Faraday Cage? And besides, if you have to write down a number someone gives you, isn’t it silly to ask to borrow a pen when there’s one in your ear? How do I get one or two of this pen mobile phone?? How can I get 4 of these pen mobile phones ? And where can I buy them?